Boasting superb bathrooms in Capri marble and Zimbabwe granite, the warm, contemporary 20m² Classic Guestrooms are quiet and comfortable. 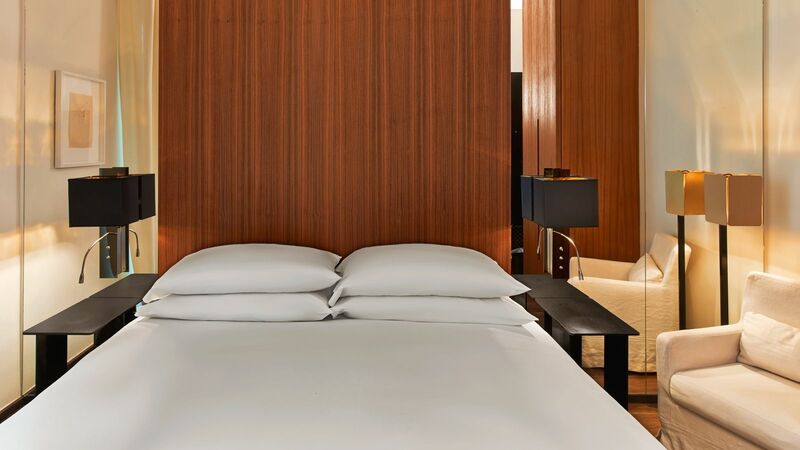 The 24m² Deluxe Guestrooms feature contemporary Parisian décor, comfortable beds, office spaces, and bathrooms in Capri marble and Zimbabwe granite. The parquet floors and raw wood furniture create warm places ideal for working or relaxing. The cosy 40m² Junior Suites overlook the city’s rooftops. Their natural materials, muted colours and superb lithographs are restful and relaxing. All the bathrooms feature Capri marble and Zimbabwe granite, including bathtubs as well as Italian showers. 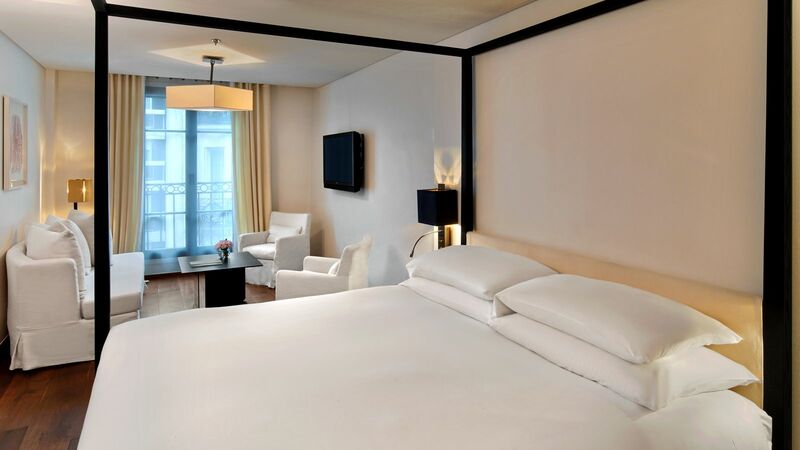 As their name suggests, our 40m² Eiffel View Suites offer incredible views of the Eiffel Tower directly opposite. Boasting spacious living rooms with large sofas and comfortable armchairs, their restrained, elegant decoration is an invitation to serenity. The superb bathrooms, all in Capri marble and Zimbabwe granite, have bathtubs as well as Italian showers. Located on the sixth and last floor, the signature Eiffel Suite is considered to have one of the hotel’s most beautiful views. 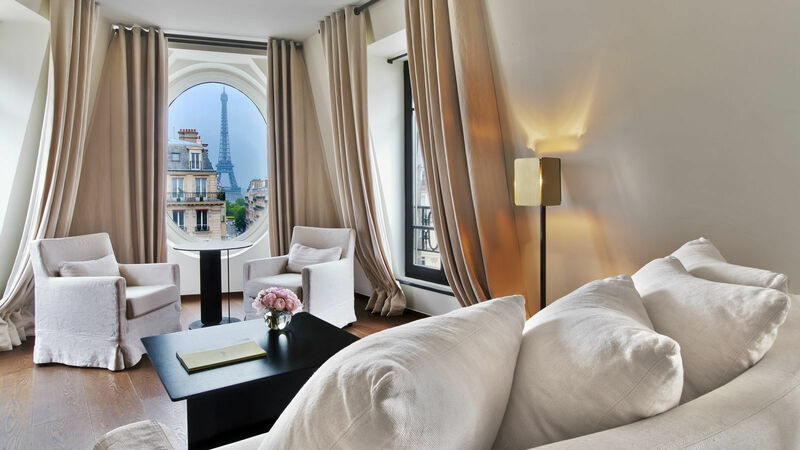 From the comfortable bedroom to the spacious living room, its oval window offers breath-taking views of the Eiffel Tower and entices you to explore Paris. 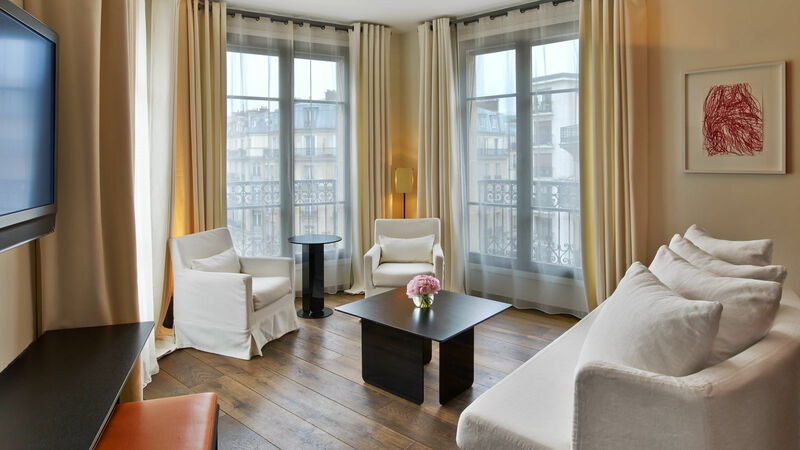 Its comfort and design — a perfect mix of sobriety, elegance and Parisian chic — make this an ideal oasis of peace during a stay in the capital.